Launchpad couldn't import bug #12370 from freedesktop.org Bugzilla. I'm running Gutsy Tribe 4 with all the latest updates available through apt. What happens: When X starts, all I get is a black screen. I've had to switch to the VESA driver to get X up and running. Expected behavior: X starts normally. This has only occurred since the xserver-xorg-video-ati update on the 14th, so it's a fairly new regression. I will attach broken xorg.conf, lspci -vv, and lspci -vvn. Same happened to me (also on Mobility Radeon 7500) on my Dell Inspiron 5100 (i was just about to file a bug report). This is what I updated last night (in case someone can figure out it has something to do with another package upgrade than xserver-xorg-video-ati but it's the only one I can come out with too. I'll attach my xorg.0.log too (where I can't find any errors explaining the problem). Since upgrade of ATI drivers yesterday (15 August), get a black screen when X Starts. ctrl-alt-backspace is broken, can't get back to command line. Ran today's update ( 16 Aug ) which updated fglrx driver and xorg and the problem is still there. My xorg.conf is dated July4, so I'm not sure providing this is going to help as the the system was working fine until the latest updates. I also had this bug with Radeon 9700 mobile. I resolved the problem removing my xorg.conf. Did you just delete the xorg.conf, or did you need to reconfigure it as well? Same problem (Ati 9600). I had to disable agpfastwrite for X to work. Disabling AGPFastWrite didn't fix my dualhead setup. (Tried to disable it on both devices and also only for the VGA device.) One note: when I use my original single screen setup, the desktop gets correctly cloned to both screens. Could someone at least mark this bug as confirmed? A lot of you seem to be playing with various radeon-options.. please don't do that. If it works for you without the xorg.conf, maybe it's the options that broke it. To the ones with the same bug as the original reporter; try playing around with the MonitorLayout -option, or disable DRI. Confirmed with Mobility Radeon M24. Works with Vesa-driver. I have clean install of Kubuntu Gutsy Tribe 5 and first boot after install ends with black screen and a system freeze. 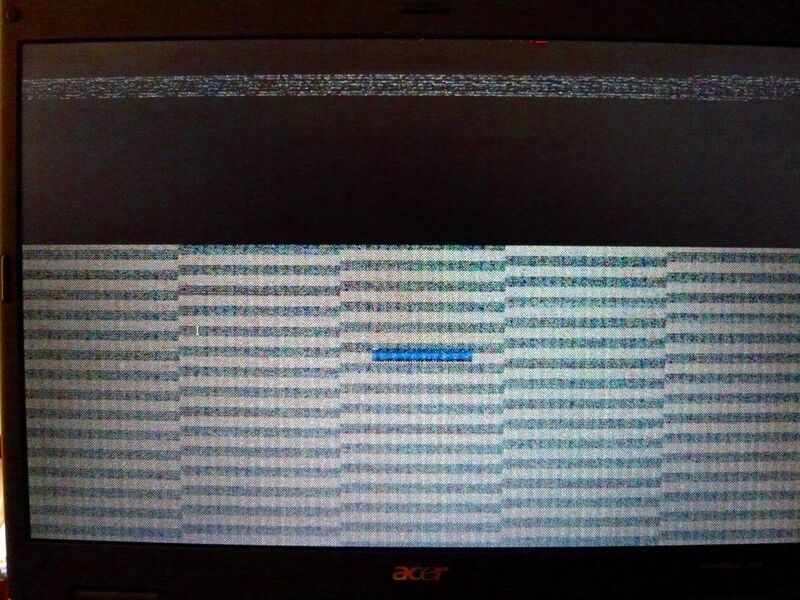 Removing xorg.conf causes my screen to be white and a system freeze. My display adapter is Mobility Radeon M6 LY not Mobility Radeon M24 as i wrote above. Latest updates to Xorg seemed to resolve issue for me. It seems to be still broken. My display adapter doesn't work if power supply is connected. I used my laptop with battery and thought this issue was resolved. If I connect power supply my screen fills with carbage. Gutsy tribe 5 livecd works fine though with power supply connected. Can somebody else test this with battery only. I can confirm that my desktop's dualhead setup is still broken with the latest updates (Tribe 5). I am still having this problem (sorry, was out of the country for a couple of days, I actually hoped it would be fixed by now but doesn't seem so). I did a full upgrade without any effect. - I tried to play around with the MonitorLayout option, but this doesn't solve anything either. I don't have an external screen to attach to my laptop, so I still don't have anything but a black screen. - I backed up my xorg.conf and then did a reconfigure, but also without any result. Thus far, I don't see any solution coming up to see my X on a single screen setup on my laptop. Still broken for me with latest updates. Running on battery or on AC power makes absolutely no difference -- perhaps the person experiencing that has an unrelated ACPI bug? Downgrading to 6.6.3-2ubuntu6 fixes the problem in its entirety, so there's definitely an issue with the upgrade. My system is updated to todays state (ie 1/Sept). I still have this problem. By the way this means I have to do a hard restart, I cant get out of it with ctrl-alt-backspace. 1. Re-enable AGPFASTREWRITE and restart X. Result: X starts successfullz but Gnome gives an error message on trzing to set some properties. Same here, it didn't fix my problem. The xserver-xorg-video-ati_6.7.192-1ubuntu1_i386.deb downloaded from http://people.ubuntu.com/~bryce/Testing/ati/ worked actually even worse with my dualhead setup: even the left screen connected to DVI was blank. It seems that X crashed completely with this setup. On single monitor setup this driver worked like the "real" Gutsy's driver. How about going back to the old driver If this can't be fixed before Gutsy is released... ? there is some logs that i I hope can help. I agree that 137396 may be a duplicate, and I don't think it's a compiz bug, so probably more appropriate here. I'll leave it to your discretion. also, run "dpkg-reconfigure -phigh xserver-xorg" to get a clean xorg.conf. It doesn't generate a Modules-section anymore, and that could help here. I tried all previous suggested options, still without any change: the screen remains black (even after getting the clean xorg.conf). and have the result of screen blank with errors like the picture attached. (**) | |-->Device "ATI Technologies Inc RC410 [Radeon Xpress 200M]"
(WW) Including the default font path /usr/share/fonts/X11/misc,/usr/share/fonts/X11/cyrillic,/usr/share/fonts/X11/100dpi/:unscaled,/usr/share/fonts/X11/75dpi/:unscaled,/usr/share/fonts/X11/Type1,/usr/share/fonts/X11/100dpi,/usr/share/fonts/X11/75dpi,/var/lib/defoma/x-ttcidfont-conf.d/dirs/TrueType. Tormod: could be. Do you think it's related to this bug? I made a new dual head config after the suggested "dpkg-reconfigure -phigh xserver-xorg", it's attached in this comment. I'll post the log in a minute. and have the result of screen not blank but with wallpaper :) but with errors yet :( like the picture attached. This bug is about the Open Source X.org ATI Driver supporting older Radeons, FIreGLs, etc. fglrx is a proprietary, closed-source driver for newer Radeons. After i change the xorg.conf i could start with a resolution of 800x600 pixels. Then i use the grafical tool to chance the resolution to 1280x1024 pixels, the normal resolution of my display. The Problem is that my solution is use the vesa driver. 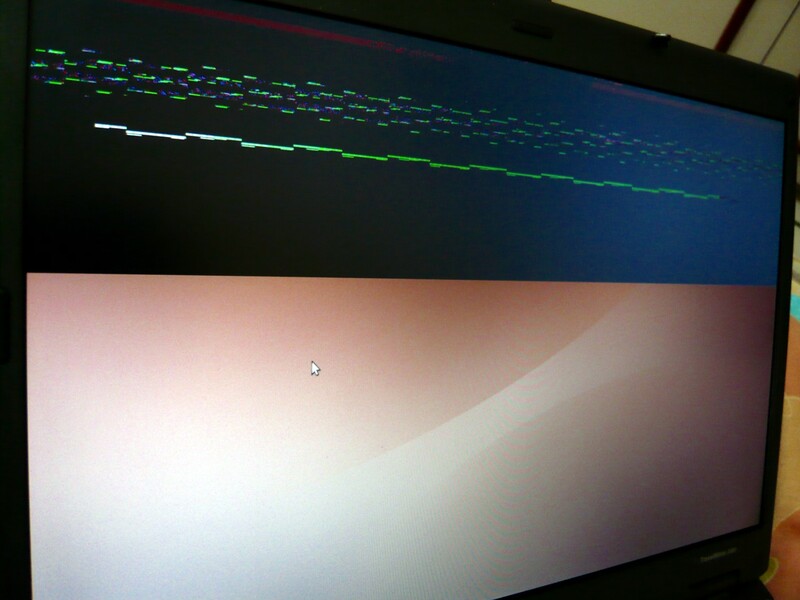 The new ATI driver at http://ppa.launchpad.net/tormodvolden/ubuntu/pool/main/x/xserver-xorg-video-ati/ don't works. Only get the *black screen of dead*. I gots gutsy running on an ATI Radeon Mobility 7500 and no black screen... though, it does go black for a second or two during bootup. However, everything I move something on the display my CPU usage skyrockets! The xorg.conf says the driver is "ati" not fglrx. Sascha, I think you should open a new bug report. You have another card and probably another issue than David. Same happened to me (also on Radeon 9200) on my Desktop. I only install with safety mode, but don't have all power, like i can't use compiz. 10202007 amd64 driver works for me (ATI Radeon Xpress 200G; mobo integrated) after I blind logged in, Ctrl+F7, xrandr... and rebooted. I also activated the ATI proprietary driver before installing Tormod's version which is recognized as the most recent. No "LVDSBiosNativeMode" Option added to xorg.config either. Should I file for a new bug or wait for the official driver update? As reported on this launchpad I can't figure out if bug is related only for mobility Radeon 7500 using opensource driver or not and if the main problem refers to "blank" or "black" screen. So I decided to open another bug report on https://bugs.edge.launchpad.net/ubuntu/+bug/154586. If somebody conclude its a duplicate bug report, please feel free to change it. victor, yes please open a new bug for the resolution issue. David, could you please check if this bug is fixed in xserver-xorg-video-ati_6.7.195+git20071020tv ? Yes, I can confirm, driver 6.7.195+git20071020tv solved the problem with dark screen on start up for Radeon 9600 RV350. I have the same problem but I'm a complete newbie on all this.... How do I do to install the xserver-xorg-video-ati_6.7.195+git20071020tv in my Gutsy Gibbons? Please read the previous comments to find the links, or wait for an official update. Looking forward to an official update. How long will it propably take? I'm still with Feisty Fawn. I have downloaded and ripped to CD Gutsy but I've heard about the bugs related to ATI's so I guess I will wait until the bugs get fixed. Feisty works ok with Beryl and Compiz. Only when I have a video "running" and if I rotate the Cube the screen turns black:( I could never solve that. Maybe it's because of being an ATI. My Laptop runs ok, but has an Nvidia Geforce Go 7300. Desktop: Intel i386, PIV, 3.4GHz, 1 GB RAM DDR 400, ATI 9200 Radeon. Hope this can get solved! Biber, we'll probably wait until 6.8 is released upstream. Maybe some weeks from now. nunoribeiro, you can always check with the live CD if things work fine on your hardware. And thanks to everybody testing the work-in-progress. Upstream is very grateful for your feedback, which helps to make an excellent final release. It's better a fresh install rather than an upgrade right? Note that you can even install packages like compiz-tools-config inside the live session, if you have network and enough RAM. Yes, a clean install is always a bit safer than upgrading, but it adds the hassle of reinstalling what extra packages you use and any configuration you have done. Yes I know:( And I have a lot of Packages so organized:) I use Gnome all the time, but I used Kopete as my preferred instant messenger, and a lot of other:) I will make backup up of everything and test either ways. I mean, first upgrade and see what's going on. If everything is ok I'll keep it! Here is a possible workaround, and clue. I too had no video when I installed 7.10. However I did have version 7.04 installed and did a full install of 7.10. Out of curiosity, I re-installed 7.04, then I did an UPGRADE from 7.04 to 7.10 Per the instructions for upgrading. I now have video!! It would be interesting if others can do this too. wb8erj, the most likely explanation would be that the xorg.conf generated in the 7.04 install works better than the one generated in the 7.10 install. Can you please compare them, or attach them here? On the other hand you maybe had a totally different issue than what this bug report is about. Having something like that on a laptop with ATI 345M graphics with 128 megs of shared ram, 690 megs of ram, and an Intel Celeron M 1.80 GHz processor. When I start up the laptop, everything starts out fine, and then when the Ubuntu splash screen (that's what I call the screen with the Ubuntu logo and that progress bar) is supposed to come up, i just get this screen that changes colors from black to white and other light colors randomly. It starts up about a fifth of the time, and if i hold down the power button to turn it off, it just gets stuck on the BIOS screen. Then I have to restart the computer about ten times to get back to the damaged splashed screen. An Ubuntu memory scan says there are no errors in ram. What do I need to do to what? I'm not a linux noob. Start with running system using vesa driver. Monitor goes into power save. Xorg starts consuming CPU, is not able to be killed (even with -9). black screen, xorg max cpu, unkillable. sorry for not being able to test the last version earlier. If i remember correct, I have the same configuration as David (inspiron 5100 and ATI Radeon 7500 Mobility), and i can confirm too that the latest version (xserver-xorg-video-ati_6.7.195+git20071020tv) is working without the LVDS-option. I didn't even have to insert the "LVDSBiosNativeMode" option. Everything fine. After Grub finishes I see "Starting..." string on the black screen, and the font of the string changes. But right after that the screen becomes completely black and I get a large underscore cursor blinking on the top left corner of the screen. This black screen with cursor stays there for about 3 minutes (Feisty boots much faster on the same machine, I don't understand), and right after that (i.e. after X loads) I can see the famous Ubuntu login screen with brown background. Thereafter, I don't have any problems. This has been the case since fresh install. Since I don't have any problem after X loads, my situation is not so bad. But any suggestions are welcome. Soner, that has obviously nothing to do with this bug report. I'm experiencing problems with dual-head setup and xrandr 1.2 on a recent upgrade to Ubuntu 7.10 on my Dell Latitude D810 laptop with docking station. Previously this worked with the ati driver and it still functions when I change over to the "fglrx" driver (which rules out bad hardware). At this point, my desktop is properly displayed on VGA-0 while DVI-0 displays "2: Digital Input Cannot Display This Video Mode". Is it possible that this bug is related to "crtc 0" on the ATI x600 (M24)? Identifier	"ATI Technologies Inc M24 1P [Radeon Mobility X600]"
If the issues with "crtc 0" are not related to this bug, then what is the next step in trouble-shooting the issue? Now that the bug is fixed, a note should be added to the 7.10 release notes stating such. Well, there's no official fix released for 7.10 users yet. There might be a backport later though. Anyway, the release notes link to this bug report. Displaying first 40 and last 40 comments. View all 199 comments or add a comment.